When HOW THE OTHER HALF LOVES first made its premiere in 1970, it cemented Alan Ayckbourn’s career as a successful dramatist. Almost 50 years later, the comedy of confusion continues to entertain audiences, with the latest revival embarking on a national tour following its critically acclaimed run at London’s West End. HOW THE OTHER HALF LOVES follows the lives of three couples: the well-to-do Fosters, the raucous Phillips and the meek Featherstones. Bob Phillips and Fiona Foster are having an affair and in their clumsily attempt to cover their tracks, each use William and Mary Featherstone as alibis. But it isn’t long before the Featherstones are falsely accused of adultery and with no idea as to how they’ve become involved and the future of all three couples suddenly seems in jeopardy. Clever, witty and very funny, HOW THE OTHER HALF LOVES is a hilarious tale of misunderstandings, social discord and matrimonial mishaps. The play sees two disaster-bound dinner parties performing in parallel as the Featherstones dine with each of the couples on successive nights. As the action switches abruptly between the two households, the comedy veers towards farce, delivering some impressive physical comedy, as well as some great one-liners. Leon Ockenden and EastEnders’ Charlie Brooks deliver strong performances as the young and argumentative Teresa and Bob Phillips. Sara Crowe and Matthew Cottle equally entertain as the meek Featherstones, their incredible comic-double timing particularly shining through in the combined dinner sequence. But the real star of the show is Robert Daws as the bumbling, self-deluded Frank Foster. Dawes sparkles in the dim absurdity of the man and his attempts to keep everyone on the path of righteousness only creates more disarray. Yet, while HOW THE OTHER HALF LOVES still has the capacity to entertain, the comedy quickly shows its age. 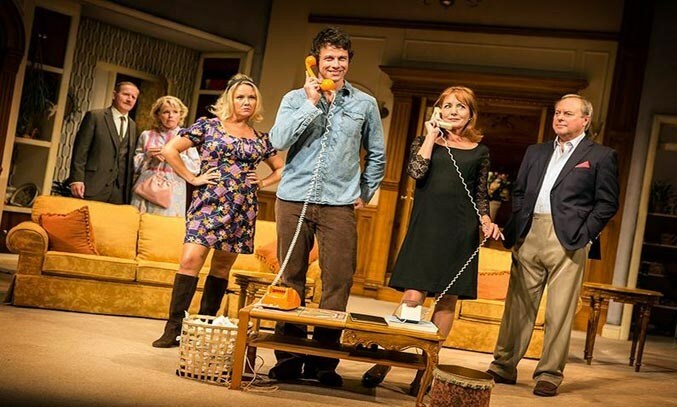 Set in the late 1960s, the plot largely relies on landline telephones for a lot of the comic business and Ayckbourn has a few sharp things to say about social class and domestic abuse, which clearly shows how society has changed in the last 47 years. That said, the play has a timeless capacity to amuse and Ayckbourn’s sharply observed characters and rapid wit continues to make HOW THE OTHER HALF LOVES one of the writer’s most famous comedies.